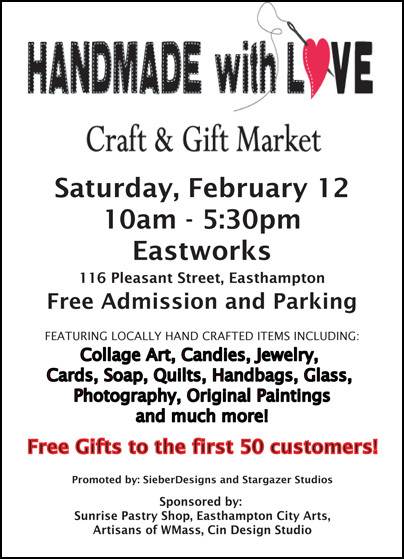 Handmade with Love – Craft & Gift Market is going to be an incredible Craft & Gift Market this Saturday, February 12 in Easthampton.Â I hope you will come (if you live near enough). There are going to be many fabulous items for sale, including my mysterious photographs in several forms. Hey, everybody, I have a request! I’m writing a book about negative experiences customers/clients have had in restaurants or retail shops. Particularly treated shabbily by either the employees and owners of the establishment themselves. For example, I’ve had MANY experiences where I entered a retail shop and felt that I ought to ‘thank the employees for allowing me to enter the store’. How’s this one – Several employees are just standing around behind the counter and there’s ONE customer (you) WAITING to be asked ‘can I help you?’ After five or ten minutes an employee turns to you, not saying anything (no greeting, nothing) waits for YOU THE CUSTOMER to respond to his/her silence. Your response is greatly appreciated and I shall add it as fodder to my book. Thank you Sue, I do need a nudge. I’ve been working on my screen play and have begun writing a book about my experiences as a customer/client in businesses where servicing the customer/client is a bit lacking. It’s sort of a primer for people who are interested in improving their “bottom line.” I believe that’s a corporate term, money – you know, increasing profits. It’s been my experience making sure the person who wants to spend their hard earned money on whatever your selling is more pampered. I just thought I would lend a helping hand in sharing some pointers that may possibly help increase their do, re, mi. How are you doing, Sue? Thank you all for all the feedback and help you have given me online and off … onblog and off. You helped me create a card I am very pleased with!! Please try to look past the border … it doesn’t truly exist … it is in another dimension and has reappeared uninvited. I will try to continue to post more often. I am making a commitment to post at least once a week. I hope you will check me out and raise the roof if I don’t keep my word. Here are the two winners so far – without borders – Now, it is possibly clearer as to which choice you’ll choose. In between the second or third hot dog that just came off the grill (or hamburger or tofu dog) feel free to send me a comment. This has been a difficult process for me – your kind patience during this time has meant very much to me. Looking forward to hearing from you. Thank you.